Published July 15, 2013 By Anna T. This post may contain affiliate links. Regardless, I only recommend sites I've researched and/or used and trust. Etsy is probably the biggest craft & handmade item marketplace online. You can find absolutely everything under the sun there that's handmade, including crafts, soaps, vintage items, and so much more. I personally love Etsy and often check there to find something I want or need before looking anywhere else just because I love having unique, one of a kind things. Etsy charges you no membership fees. They charge .20 cents to list one item for four months or until it sells, and once your item sells, Etsy takes a 3.5 percent fee from the sale price. If your item does not sell in four months, it will no longer be listed for sale unless you choose to relist it for another .20 cents. You must have a valid credit card to sign up as a seller so that they can bill you once a month for whatever listing fees and transaction fees you have accumulated. From what I can tell, they don't take this automatically out of your account. Once you receive an invoice from them, you have to pay it by the 15th of the next month. Read my review of Etsy here or sign up here. Artfire is another popular handmade marketplace that I have also bought things from and continue to hear good things about. In addition to buying handmade items, Artfire is also a great place to shop for crafting supplies. There are no fees to list your items like you'll find with Etsy, but they do charge you a set monthly fee for your online store. This fee is typically about $20 a month, but sometimes they have special offers and promotions going on that allow you to get a cheaper per month rate. Your customers can pay you with ProPay, Paypal, or Amazon Payments. Read my review of ArtFire here or go here to learn more about selling on Artfire. Shop Handmade is on the newer side so that means your items may not get as much as traffic as they might on a more popular site like Etsy, but the good news is that they are completely free to use! They don't charge you any listing fees or monthly store fees, so this would be a very risk-free way to start selling your crafts and/or vintage items. You can sign up and create a store and start uploading photos and creating listings right away. All payments you receive for items sold go to your Paypal account. Go here to learn more about selling on Shop Handmade. Hyena Cart is another big marketplace for handmade items. You can sell earth, child, and family friendly items there. While selling handmade items is encouraged, you can also sell manufactured items that you no longer need or want. Hyena Cart doesn't charge for listing items, but you do have to pay $5 a month for your store. However, this fee only applies if your store is active. Hyena Cart will not bill you automatically, so if you aren't interested in selling for a month or so, you can just not pay your $5 for that month. Overall, a very nice, easy to navigate site with lots of items. Go here to learn more about selling on Hyena Cart. YouCanMakeThis.com is a little different from the above sites because you are selling your unique patterns for handmade items rather than the items themselves. You get 50 percent of the purchase price on each pattern sold. When you list your patterns for sale, you have to decide on the rights — whether or not you are requiring the buyer to credit you when they use your pattern or not, and also whether or not you will allow the purchaser to make your item and then sell it themselves. You will be paid for patterns sold once a month. Go here to learn more about becoming a seller on YouCanMakeThis.com or check out this list of more places to sell your sewing patterns online. GLC Craft Mall allows you to open up your own arts and crafts store within their site. If you would like to open up a craft store at GLC Craft Mall, you must have a Paypal account so that you can receive payments when your items sell. Setting up a store is not free, but you can do a free trial. A basic store only costs $3.50 a month. Go here to learn more about selling crafts at GLC Craft Mall. Amazon jumps in on everything, and now they're trying to compete with Etsy as well. Their new site for crafters and DIYers, Handmade, will allow you to sell your wares through Amazon. If this interests you, you can request an invitation to let them know you want to sell. Shopify is a very popular ecommerce platform used by many major, major companies. Basically they make it very simple for you to set up your business in an online shop, using your own branding, etc. You can market your business however you would like. Unlike eBay or Amazon, your products won't show up in any sort of directory. You're basically — as mentioned above — just using their platform and tools to get your shop set up how you want it. Go here to learn more about setting up a crafting shop on Shopify. This ecommerce platform has both a marketplace and the option to create your own online store. You can sign up as a seller for free with zero listing fees or set up costs. Plus, Bonanaza makes it possible for you to import items you may have for sale on other sites like Amazon or eBay to make getting your listings in place a breeze. Go here to get started on Bonanza. This is another ecommerce platform you can use to get your crafts store set up online. Miiduu has everything you need including built-in marketing tools, easy customizable set-up, custom domains, and much more. Miiduu does have a browsable store directory and you may end up getting lucky enough to get featured on that, but ultimately it looks like most of your “getting the word out” will be up to you. Go here to learn more about selling crafts online with Miiduu. This site is 100% for handmade items. Unlike Etsy and some of the other big craft marketplaces, they don't also have food products or vintage items. If it isn't handmade, you can't sell it there. They charge a $25 registration fee and then it's $5 a month (for one of the cheaper plans) for unlimited product postings. See more details on how iCraft works here. Zibbet gives you an online storefront plus allows you to be included in their global online marketplace with other sellers and creators. They specialize in websites for people with crafts, fine art, or vintage items to sell. There are no listing fees and you can easily import any existing items you have for sale on Etsy. Memberships are between $4 and $16 a month just depending on which level you choose. Go here to learn more about how Zibbet works. eCrater is both an online marketplace and a virtual store builder. They have been in existence since 2004. While this company doesn't charge you any listing fees, you may not see as much traffic from them as you would from a more popular marketplace like Etsy or eBay. Go here to learn more about selling on eCrater. They won't allow you to sell your handmade items here unless you are a paid member of the site. It's $5 a month to become a member. Once you are registered, you can list as much as you want with no commissions taken or listing fees. Go here to learn more about Handmade Artist's Shop. Storenvy allows you have to have your own storefront as well as a listing in their marketplace for independent retailers. They do take a 10 percent cut on any of the sales you gain from the marketplace, but they do not take any commissions from sales that come from your online shop. There are also some fees for having a storefront if you add “extras” to it. Go here to learn more about Storenvy. Whether you need a marketplace or a store, Meylah has you covered. Plus, everything you create there is cloud-ready, mobile-ready, and social-ready. Their plans range from free (up to 100 product listings in the marketplace) to Premium ($19.95 monthly) for up to 1000 products. Go here to learn more about Meylah. An interesting idea for getting your crafts in the hands of others and establishing a name for yourself is by going the popular “subscription box” route. Unless you've been living under a rock for the last few years, you probably know that subscription boxes have recently become all the rage — allowing people with a wide variety of interests to get “surprise” boxes of samples in the mail every month. Cratejoy makes it very easy to start and launch a subscription box business based around your brand or products. They provide all the tools you need to get started, including a website builder, free listings in their marketplace, and much more. Go here to learn more about Cratejoy's services. If you're in the UK, you can sign up for an account on Folksy and begin selling jewelry, clothing & accessories, art, cards & stationary, and many more handmade items. They have a “Basic” account where you're charged listing fees for each item, or a “Plus” account with a flat monthly fee allowing you to list unlimited items with no listing fees. Go here to learn more about Folksy. CraftIsArt is an online “artisan” marketplace for handmade items, vintage items, art, and more. On the main selling page, they claim in large letters to charge no listing fees with no contracts. They also claim to give you unlimited listings. However, if you scroll down, you'll see that you can sign up for either a “Basic” or “Premium” account, with the “Basic” option giving you up to 100 free listings (you're charged 0.15¢ per listing if you go over 100) or the “Premium” option with unlimited listings at $7.99 a month. Go here to learn more about selling on CraftIsArt. You can create an ArtYah account from anywhere in the world and sell your handmade, vintage, and art products within their online marketplace. They do charge fees — it is $0.10 to list an item on Artyah. Once an item sells, you're charged a 3.5% final sales transaction fee on the sale price. This does not include shipping costs. Go here to learn more about selling your handmade items on ArtYah. Square is one of the easiest options out there for setting up an online store. And they charge absolutely nothing for you to do it — the only fee they take is a credit card processing fee if one of your items sells. You can create a store for your handmade items or any other product you have where you need an online storefront. The one major drawback here is that the store is all you get. There is no marketplace to make it easier for the public to find your items. Promoting your store and getting the word out is entirely up to you. You can learn more about setting up a Square store here. Creative Resale is an online marketplace designed specifically for buying, selling, trading, or donating used crafts and art supplies. The regular listing cost for a classified ad on their site is 100 percent free. You can learn more about Creative Resale here. Mercari is fast becoming a very popular app for buying and selling anything — including crafts and other handmade items. The selling fee on Mercari is 10 percent of the listing price, and they take that right off the top when you make a sale so you don't have to worry about being billed for it later. There are no listing fees at all. Go here to learn more about becoming a Mercari seller. Aftcra is marketplace specifically for people in the US looking to sell their handmade items. The items you sell here must also be made in the US. They allow you to list handmade, handcrafted items, upcycled or repurposed items, and some printed goods. You cannot list any vintage goods or manufactured products on Aftcra. There are no fees to list your items on Aftcra, but they do take a 7 percent cut of the sales price. Go here to learn more about becoming a seller on Aftcra. This is a Facebook group you can join to post your handmade items for sale in hopes that other members will be interested in purchasing. Go here to check out Craft Marketer. Another buy and sell group for people on Facebook to join who are interested in both buying and selling crafts. This is one is fairly large with over 20,000 members. Go here to check out Craft Junkies Marketplace. Another Facebook group you can join to buy and sell. This one focuses on “handmade creations and crafting supplies.” The group has been in place since 2012 and has over 13,000 members. Go here to check out Craft Living Marketplace. This is a Facebook group you can join to buy and sell crafts. They have almost 20,000 members and are open to new members worldwide. The group has been in place since 2013. Go here to learn more about how Buy Sell Crafts works. You can sign up as a designer on Ravelry and sell or give away PDF files of patterns you've created. They will allow you to earn up to $30 on their site before they charge any fees for the sales you've made through them. Go here to learn more about submitting your patterns to Ravelry. Uncommon Goods is “always on the lookout for interesting products to add to our assortment.” You can submit your designs to them, but there is no guarantee they will approve you to sell there. Go here to learn more and submit your items for review at Uncommon Goods. Want To Avoid Listing Fees? 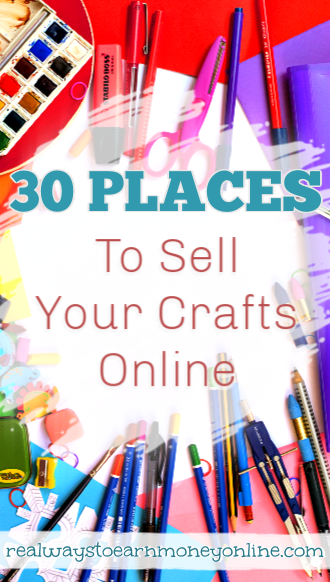 We have a list of 10 crafting sites that don't charge listing fees if you'd prefer to avoid those. If you are already a member of one or more of these sites and just can't seem to get much in the way of sales, consider signing up for Pinterest and becoming active. Follow other people, re-pin their crafts, and be sure to share all of your crafts along with a link going back to where they can be purchased. Also, be sure to list the prices for your items in the description box. If you find Pinterest confusing, the e-book Pinterest Savvy: How I Got 1 Million+ Followers (Strategies, Plans, and Tips to Grow Your Business with Pinterest) by Melissa Taylor will really help you understand more how to use it for your business. I have read this one and highly recommend it. Here are a few inexpensive e-books you can download from Amazon to learn more about selling crafts. If you do not have a Kindle, you can read any of these e-books using Amazon's free cloud reader directly on your computer or mobile device. If you have used any of the craft sites linked above or if you have more tips for promoting and selling craft products, please feel free to comment below! Good luck! Signed up with Etsy after reading this article and the information on fees is incorrect. They charge .20’per listing for 4 months (which is correct) but then there is a 5% transaction fee and then an additional fee of 3%+.25 for payment processing fees so keep that in mind when listing items. I ended up closing my store after listing more than 20 items when I got to the fees page. Unless u price your items really high, I don’t see how it is a money maker. I have been a seller on Etsy.com since 2016. I have become very disenchanted with them since they changed just about everything in the last year. I do HAND Crafted and designs, I am the sole person in my shop and am self funded. Seems that now unless you are willing to invest a sizeable amount of money on inventory or take on a lot of debt for marketing you don’t get featured or promoted. Also there are A LOT of stores that are selling items that are NOT hand made at prices that someone that puts quality above quantity cant compete with. Thank you soooo much!! This is very helpful and great advise! recently and this is a perfect pin for me to get started! As a amateur photographer, I was just if you have any suggestions where I might be able to sell my work? So glad I found this. I was looking for places to check into where I might sell my personal creations other than with etsy. Sooo much there that it’s easy to get lost. But this blog has really helped, so I look forward to taking advantage of this information. … Thanks so much. Aftcra is another site that is free until you sell something. I have tried to open a shop in a couple of the other places mentioned above (shophomemade & GLC) but all of my images were too big. I did not have that problem with Aftcra! And since I’m unsure how to make my images fit their parameters, I have opted not to open a shop…no hassle with Aftcra. I think it’s fairly new and I’ve only made sales to people who know me but I like the free part! Thank you for sharing, I am going to read and try suggestions. There is also Scott’s Market Place, Storenvy. Square also has online store for you to use. Thanks for the list, I’m still trying to figure out the best one for me, but I didn’t know there was some free ones. Hey folks, I created a site called VendorWiki to help local crafty folks advertise and sell their home made products and services to the local community. Vendors can create or join local trade communities, add products and create Sale Events to share with their favorite social media groups. VendorWiki simply accepts the order request from the customer for the vendor. The customer then picks up the goods form the vendor and pays on the spot. No money is exchanged online. There are no fees or commissions – though later I may add premium features. Tell me what you think at feedback@vendorwiki.com. Be wary of Etsy, they changed their business model and now allow people to sell things that have been manufactured overseas. So that “hand made” item may in fact have been made in a factory. A lot of Etsy sellers, me included, have left because mass manufactured items which are less expensive than actual hand made items. The move hurt a lot of crafters. That’s really sad. Crafters work very hard to make their items. Shame on you Etsy!!! Thank you for all the great ideas on where I can sell my Craft. I’ve been on Etsy for a little while now and I’m finding it hard to stand out. I sell handmade all natural bath and beauty items, it is over saturated. Hi! I am glad I found this. I am a new seller on etsy and I am glad I have chosen that sight. Thanks for the great post! Hi. Another great place that is under new website management is http://www.craftersbuzz.com – I use them for our wood and metal crafts. Create your own craft store / profile and link to any place you’d like. Free to join and post with no commissions taken. don’t forget zibbet.com sell your crafts there too…..
Another New site I found to sell arts and crafts is http://www.crafterstown.com You can open up a store front with no upfront fees and only pay 4.5 percent when you sell something. I’ve been selling on Etsy for many years and I have also tried Artfire, Storenvy and many others, none have gotten as many sales as Etsy. I still hope to find another website that can compete with Etsy, and also have a nice design layout website. If anyone knows, would love to check it out. Thanks. Some people do really well on Storenvy, and Zibbet is another option. Both are free, but Zibbet does have an account upgrade available if you want to pay for more features. A newer site similar to Etsy is Trinksy. No monthly fees and similar listing fees. Thanks Shannon! I went to Craftsy and was wondering if they let you sell stuff (or patterns) there, but didn’t see where you could do it. I appreciate the info! I stumbled on your blog through a link on blogelina and I luv it! Awesome money making opportunities!!! Great read too on your earnings, time it took, etc – thanks for sharing!